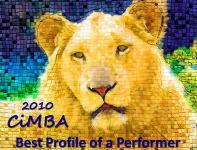 Thanks for providing the fascinating background. "Ride the Pink Horse" is the same sort of absorbing read that you describe "In a Lonely Place" as being. The film version is also fine. You get what you start with, even with the changes. Eve , great post on one of my favorite Nick ray films/ I don't know if you knew that Nick and Gloria were "On The Rocks" during the shooting and Nick was worried that if it got out Gloria might be replaced,.It got so bad that Nick moved in to his office. With that philosophy we could all go on a violent streak and be forgiven. According to Patrick McGilligan in his bio on Nick Ray, Bogart actually "relished" wanting to play Dix as a cold blooded killer but the censors would not allow it to happen as you write. It is always interesting to see how the source novel differs from the movie, and the many reasons why. The novel by Dorothy L. Hughes sounds like a good read worth hunting down. I have never read the book but.. I really enjoyed watching the film, A Lonely Place. It is very interesting watching Bogart character, go from very charming to very unlikeable. I think Grahame, also pulls off a difficult role, when she is torn between love and terror. It is too bad they never worked together in another film. Hi Caftan Woman - I'm planning to read as much of Dorothy B. Hughes as is available. "In a Lonely Place" is first-rate. Paul - Yes, I've read that they split during filming and that he slept on the set, etc., to keep it quiet. I've also read about the final straw in their break-up - Hollywood Babylon!!! John - I'm laughing, because I thought the same thing about 'being a writer' - it's OK to throw a tantrum if you're a writer! It would have been interesting if Bogart's Dix had been a serial killer...in the book, however, Dix is very successful at gaining the trust of young women because of his looks, charm and polish - plus he's in his 20s, so he seems like a "catch." Dawn - The book is obviously VERY different, but extremely good. I think Bogart gives one of his best performances in the film version as does Gloria Grahame. She was born for noir, wasn't she? I'm not the biggest Bogey fan, but this is one I really admire him in and Gloria Grahame was perfection. It's amazing how many stories there are behind, in between and during the story. I guess that's why we are always fascinated. I totally enjoyed your post - informative and full of the stuff that dreams are made of (oops - wrong book/film!). (Eve, my company left early!) I've been looking forward to this article and am not disappointed! What an incredible difference between the book and the movie. They really are, in essence, totally different stories. Same characters, some of the same events, but wow what a difference! The movie is a marvel of film noir, and probably would not have been if it stuck to the novel faithfully. It seems too dsiturbing and the main character has no redeeming qualities, which usually shows up in the star role of a film noir. Also because of this, I think Ray's decision about the ending fit the noir genre better than that of the novel. After your description, I'm dying to read it. I hope the library has it! I couldn't help but think about why Dix was considered acceptable in the movie ("Perhaps emphasis on the devotion of his friends was meant to cue audience acceptance. And perhaps the mores of mid-century America allowed the brutish acts of a man otherwise labeled 'good' to be tolerated.") I have another reason I believe audiences accepted Dix -- because it was Bogart. If the part had been played by an unknown actor, I would imagine the character would not have had any empathy from the audience. But because it was Bogart, and everybody loves him, we could overlook the obvious pathological nature of Dix. Just an opinion, but I know that's true of me. One of your best articles, Eve. I hope I do as well with my novel to film articles! FlickChick - One of the things I like so much about Bogart's performance in "In a Lonely Place" is his willingness to go as far as he did into Dix's very dark side (my other favorite dark character of his is Dobbs in "Sierra Madre"). Gloria Grahame was a perfect foil for the sort of troubled male character that Dix Steele was. 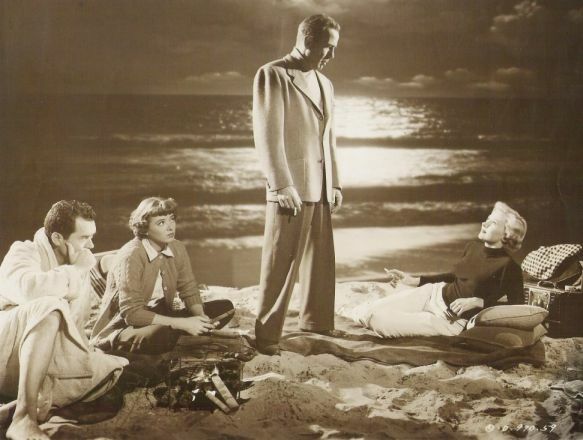 Apparently Ginger Rogers was first choice for the role of Laurel, but Ray had his soon-to-be ex-wife in mind. He was so right. Becky - For me, the fact that it was Bogart portraying Dix didn't do much toward making him likeable. You could almost say that "the emphasis on the devotion of his friends" was a cue to remind the audience that it was Bogart they were watching and he, of course, is a great guy. I do think that behavior like Dix's (in the movie) was more likely to pass - or be confused with - machismo in that era than it is today - and be tolerated (especially if acted out by a 'great guy'/Bogart). I hope you have a chance to read the Hughes book, Becky, it is far better than my description. Though the killer is revealed early on, there is so much that is unknown and only gradually revealed that a high level of suspense/tension is maintained 'til the end. Really enjoyed reading this. Reminded me I need to watch In a Lonely Place again soon. Great post. The book sounds fascinating, and I appreciate your comparison between book and movie. I haven't seen the film in many years, but I was so turned off by Bogart's character that I was surprised at how well-regarded the film is. I need to watch it again; perhaps age/maturity will give me a new perspective. Meredith - I hope you have a chance to see "In a Lonely Place" again soon. Would be interested in your take. 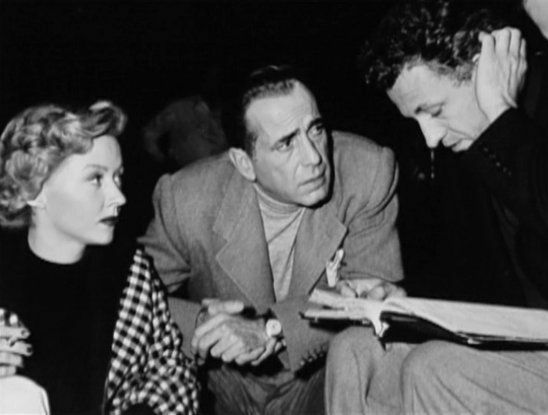 Film Boy - I think "In a Lonely Place" is very well made and contains some excellent performances. I like it. Still think there's a plot disconnect between who Dix Steele is and how he's described by other characters in the film, tho. The book is great. I haven't seen "In a Lonely Place", but in this clip Bogart comes off like the date from hell. Actually, Bogart was a master at finding the sympathetic side in a hard bitten character - this Dix guy comes off like a psycho, so if Bogie manages to pull it off with this character, it's quite an accomplishment. I've always found Gloria Grahame fascinating to watch - I agree, she is probably the ultimate film noir actress. I'd like to see this film - I'm not sure how I've missed it. 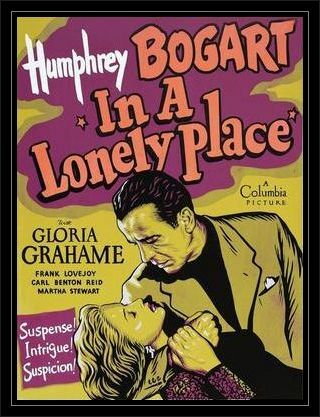 MB - Bogart is excellent as Dix, an extremely precarious character ...would be interested in your take on "In a Lonely Place." Thanks for the background on the novel. 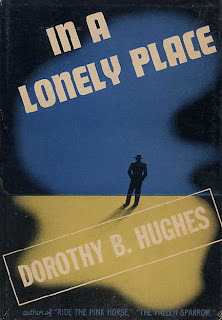 I've never read it, but now I want to read Dorothy B. Hughes. Also so interesting to compare a novel with the movie. Great post. Jacqueline - Happy to recommend a fine writer...I'll be reading more Dorothy B. Hughes myself. Eve, I loved your in-depth post about the differences between the novel and film versions of IN A LONELY PLACE! 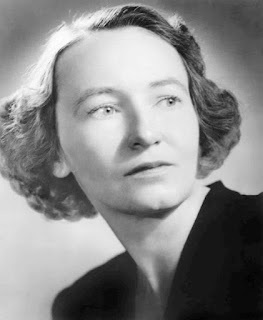 When I came across Dorothy B. Hughes' THE FALLEN SPARROW, I was hooked on her books instantly, and I've been tracking down more of her work ever since.